Mickey Jones, who played drums on the famous 1966 world tour with Bob Dylan and the Hawks/Band after Levon Helm left the group, released his own 8mm film footage from the tour on VHS and DVD in October 2002. The title of the video is World Tour 1966, The Home Movies. 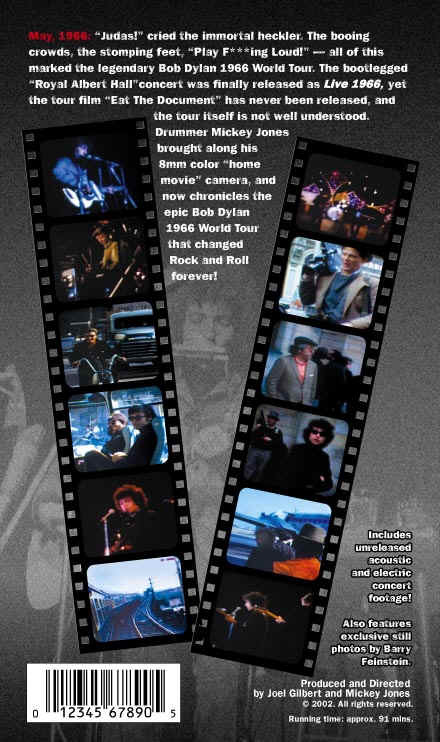 1966 World Tour, The Home Movies is an insight into Bob Dylan, his first electric tour, and a behind the scenes look at the making of the film Eat the Document. Mickey Jones' never before released home movie footage features Bob Dylan and The Band - Robbie Robertson, Rick Danko, Garth Hudson, Richard Manuel, and Mickey Jones - traveling through Hawaii, Australia, Sweden, Denmark, France, England and Ireland in the Spring of 1966. Also featured are Eat The Document filmmaker D.A. Pennabaker, Howard Alk, Albert Grossman, Victor Maimudes, and Bob Neuwirth. See the World Tour 1966 Home Movies web site for more information. 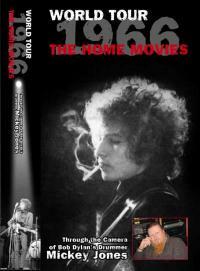 Bob Dylan & the Hawks - 1966 World Tour, The Home Movies - 91 min. - 2002 - ?